One of the key benefits for many people when initially purchasing their oak flooring is that your floor boards, if looked after properly and regularly maintained, can last you for years and years and you can enjoy all of the benefits of oak flooring in your home. Another benefit of having oak flooring installed in your home, from living rooms to bedrooms and hallways to basements; you can re-vamp and upcycle your oak flooring. You might choose to have a slightly more fresh appearance to your floor or even to totally change the appearance of your floor and give your room a makeover that starts with your oak floor. Upcycling and refreshing existing possessions is something that is becoming more and more popular for all kinds of things, from upcycling older clothing items to give them a new lease of life to upcycling furniture to make the most of items you already have or to work on upcycling projects as a hobby. Take a look at our Pinterest account for some of our favourite upcycling projects that we have found people sharing. If you want to refresh the look of your oak flooring, there are a few things to consider before you start. You will want to have an idea of what kind of “look” you are going for in your room and how any changes that you make will affect the overall look and feel – you don’t want to go to the effort of adding a coloured lacquer for it not to blend in well with the rest of your furnishings! It is also important to make sure that your floor is clean to begin with before you make any changes to the boards – you might even find that after a good clean you have a new appreciation of your floor and don’t want to make any changes! If you have underfloor heating installed in your home, make sure that you are not going to make any changes that will impact on the efficiency of the heating system. Perhaps you don’t have underfloor heating currently and are looking to bring a touch of luxury into your home – we have a beautiful range of flooring suitable for underfloor heating that you can browse here. You also need to make sure that you know what type of oak flooring you have installed so that none of your refreshing efforts actually damage your floor, for example; if you have engineered oak floor boards and are thinking of having a professional sand and refinish of your floor boards, you need to make sure that you have a sufficiently thick wear layer on top of the board to handle a proper buffing. At Oak Floors Online, we pride ourselves in supplying only the very highest quality oak flooring, which is why all of our engineered oak floor boards have a minimum of 4mm wear layer that improves strength and durability significantly over the 2mm that many suppliers of oak flooring stock. The two main types of oak flooring finish are lacquer and wax; a simple top up of your original finish can often be enough to bring your flooring as close as possible in appearance back to how it looked when it was first installed. A lacquered finish will give you more of a high shine appearance finish to your oak flooring than a wax or waxoil finish. A waxoil finish is much easier to refresh and “top up” on your oak floor than a lacquer finish and also gives a more natural appearance to your oak flooring. Make sure that you use a very fine steel wool to remove any surface stains before refinishing your oak flooring with a new coat of waxoil. We have a range of waxoils available to order here if you are refreshing your oak flooring finish. Once you have finished applying waxoil to your floor and it has completely dried, you can buff the area using a soft cloth to bring vitality back to the boards. Adding a coloured lacquer gives you the flexibility to update the look of your floor in nearly any colour you can imagine – we have even seen bright red lacquered oak flooring in homes of football fans! 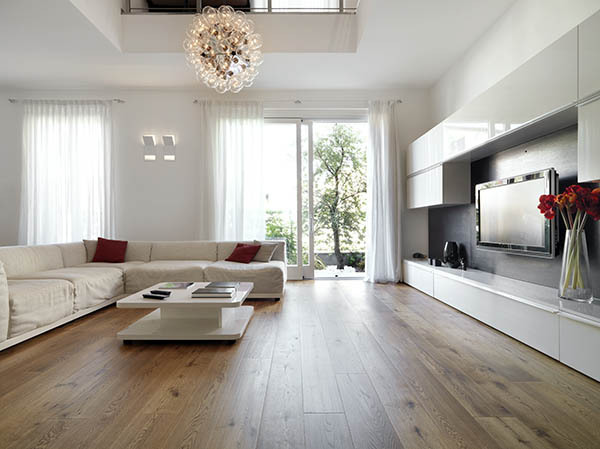 A lacquered oak floor refresh is an excellent way to update the look and feel of your room to a more modern vibe. Popular lacquers for nursery rooms include off-white, which gives a lovely crisp, clean feel to a room and can be easily accented with placement rugs and also popular is a more warm and cosy mocha tone that can be lifted with cream and vibrant coloured rugs. The most comprehensive refresh that you can have for your floor boards is to have a professional sand and refinish, however this is a big job and can be very time consuming. Many customers find that using a buffer that has been hired and adding a wax oil or lacquer is normally sufficient to give the m akeover required, however if you are looking for the “ultimate” refresh, sanding and refinishing will restore your boards almost to their former glory. You can also take maintenance and protective measures to ensure that your floor looks its best for as long as possible by utilising products such as self-adhesive floor pads for the bottom of furniture legs and by using cleaning products that are specifically formulated for use with oak flooring. We stock Blanchon Lagoon Floor Cleaner, which is ideal for cleaning and preserving the original finish of lacquered and oiled wood floors. Many of our customers with oak flooring already installed in their home have found that when they have undertaken tasks to refresh and revitalise the flooring that they have, they also begin to look for oak flooring for other rooms of their home. If your refreshing and revamping of your existing oak floors prompts you to consider installing oak flooring to other rooms in your home, we offer free samples so that you can see what the flooring will look like in the room before it is installed, for example to see how the light catches the grain at different times of the day. We have helpful guides and how-tos available to help you to make the right choice for you and your home when purchasing oak flooring and if you have any questions, we are always happy to help – you can get in touch with us here.